This page is a translated version of the page Wikimedia movement and the translation is 17% complete. جنبش ویکی‌مدیا متشکل از افراد و گروه هایی از مردم است که دارای اهداف و فعالیت های مشترک برای ایجاد و حمایت از دانش رایگان و آزاد محتوای آموزشی هستند. 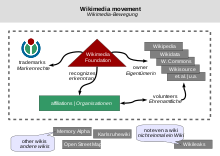 More generally speaking, Wikimedia stakeholders may also be part of the Wikimedia movement, i.e. readers of Wikimedia content, donors, schools, گلم, similar-minded institutions, and companies co-operating with the Wikimedia Foundation or other Wikimedia organizations.